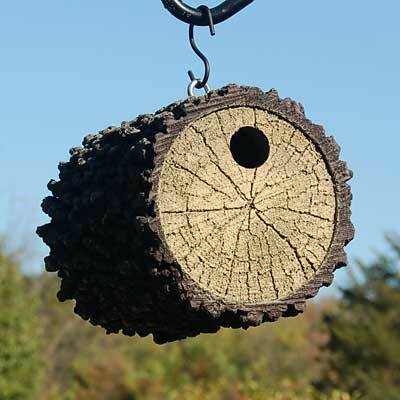 Add a unique, nature-inspired bird shelter to your yard with this Heath Oak Pattern Natural Living Wren House. This striking shelter perfectly mimics a section of an oak tree, thanks to its round body and deeply textured exterior. Handpainted gray, brown, and tan hues add extra dimension and realism to the item, and the UV resistant paint remains beautiful for many seasons. Each flat end of this home sports a softer brown tone and impressed lines, and a 1" diameter opening on one side allows small birds to enter the piece. The opposite end may be removed at the end of the season for nest checks or cleaning, and an eyehook on the top of the log makes it simple to hang. Its polyurethane construction forms a strong yet lightweight shelter, and allows for striking, realistic detail throughout the home. This unit will certainly withstand use for many seasons, while enhancing the rustic motif of your garden. Place a cleverly designed nesting box in your yard with this Oak Pattern Natural Living Wren House. Made in the USA.